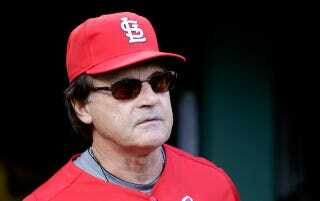 Tony La Russa gave the commencement speech at Washington University last week. It was, like most commencement speeches, sort of rambly and boring. But there was one La Russian moment that caught our attention, in which the old manager started going on about Styx, the machines, and sabermetrics. It occurs to me that, I mean I've talked to our teams about this for a long time now, there was a title of a song that Dennis DeYoung wrote for Styx, "Best of Times/Worst of Times." I hate the word "worst" but these are the toughest times. What do I mean by that? For all of you, things used to be simpler. Now there are a lot of distractions. When you go forward, values that used to be automatic are not. You have people who just look at you as a Washington University graduate, be envious, they haven't paid the price that you have paid, they will try to … I mean in terms of study and effort … and they will try to distract you and try to remind you, and those are tough. There's also a real emphasis now on machines, and what they produce, and baseball, it's this thing with metrics and analytics and they claim that they can tell you who to play, how to play, when to make changes, and that's, it's a nice tool. I will suggest that you study and prepare with all that kind of information but when you get into it, be aware of the reliance on machines and prepared knowledge. So those are the worst of times. It used to be easier. To summarize, the manager whose willingness to use situational relievers in ways dictated by the machines was more influential than anyone or anything else in bringing cold, dry math to bear on baseball as it's played on the field has a message for you: Times are tough, don't get distracted, and be aware of the machines. Got all that? Excellent.